Comments : I love this breed and keen to have one in the near future. 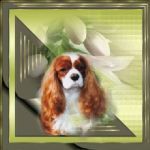 Comments : I'm searching for a registered breeder of Cavaliers as we are looking to add one to our family in the near future. Comments : Hello from shirou Colyer .I have grown into being a beautiful little girl who is very cheeky .and loveable .I love nothing better than cuddling up on my mum and dads bed. Comments : Hello from shirou I have grown up to be a very beautiful and loving little girl .who loves her cuddles.I love nothing better than sleeping on my mum and dads bed .